Jeff Sundin Fishing Report December 29, 2017 - "Icing the Iceable"
As you’d expect, ice conditions have improved vastly during this period of subzero temperatures. 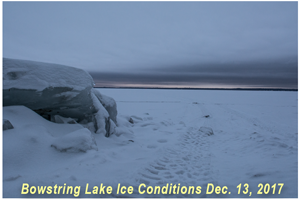 Most lakes in the Itasca area now have sheets of solid ice ranging in thickness between 12 and 18 inches. The ice under my fishing shelter at Bowstring Lake was 14 inches on Tuesday. Closer to home, we’ve found 12 to 13 inches of ice on smaller, deeper lakes near Grand Rapids. Snow cover remains light, but there is definitely enough to make snowmobiling enjoyable. 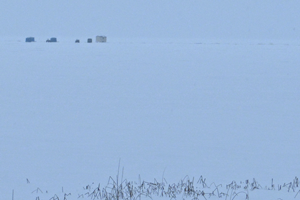 Safety issues aside, pulling a portable ice shelter behind a snowmobile is by far the most efficient way to ice fish. But if you prefer driving a pickup truck on the ice, you’ll be among friends this weekend. Pickup trucks outnumbered snow machines on the lake we fished this Wednesday. The cold weather has not worked in favor of action oriented ice fishermen. 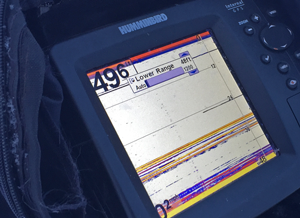 On Wednesday, we watched the screens of our Humminbird’s as fish moved in and out of viewing range. They would swim up to our lures, take a look and then lazily float away without engaging. It was not an issue of being in the wrong place; we simply had to wait all day long for the fish to begin feeding. During the period from 4:00 PM to 5:00 PM the images on my screen were exactly the same as those I’d been watching all day. The difference during that hour was that whenever small groups of fish appeared on my screen, they’d come to the bait and strike, instead of swimming away. The fish were very selective about which lures would trigger them to bite. For me, observing the lop-sided nature of that feeding run was the most interesting part of our experience; here’s what happened. At odd intervals throughout the day, we had caught just enough fish to know that there were Crappies, Walleyes and Bluegills all roaming the same slow tapering break line. It seemed like a good idea to have one rod rigged up for Walleye and another one rigged for panfish. That way when the sun dropped behind the trees, I’d be ready for anything that swam into the area. I rigged one rod with a 1/8 ounce Gold Quiver Spoon tipped it with a minnow head. The other rod was set up with a Yellow/Pink Tungsten Toad and I tipped that with an artificial plastic tail. I was jigging the Quiver Spoon for about 15 minutes before the first struck and it was an “eater” size Walleye. That was encouraging, so I kept on jigging, but the next fish I nabbed was a Crappie, not a Walleye. That was a nice bonus I thought, but surely a fluke, the 1/8 Quiver Spoon seemed rather large to be used as the primary bait for Crappies. Guess what, the next 5 fish in a row were all Crappies, that’s what they wanted, that large flashy spoon. There’s no telling how many I may have caught on the Tungsten Toad because someplace along the way, I caught a Crappie on it and broke my line bringing it onto to the ice. I never had time to re-tie because the Quiver Spoon was already keeping me busy enough. My fishing partner Jon was in the next shelter over and had decided to stick strictly with the panfish setup he’d been using all day. He had his rod rigged with a Lindy Tungsten Bug tipped with 2 wax worms. When the feeding run started, his first fish was also an “eater” size Walleye. That was encouraging too, so he stuck with the Tungsten Bug and waxworm combo. The next fish that struck his lure was a Bluegill, not a Walleye and guess what; his next 5 fish were all nice Bluegills. Bear in mind that we were only a few yards away from each other and both of us were seeing and catching fish. But armed with different lures, we were unknowingly targeting very specific species of fish. In all likelihood, we both had fish of every species looking at our offerings. Unless we’d been fishing together, neither of us may have realized how specific the fish’s feeding preferences really were. We could speculate about why each fish was eating which lure and why. But the takeaway for me is that I’m gonna be sure that I have extra rods rigged with a wider variety of lures so that I can alternate presentations more efficiently. Okay, so there’s what I know about that, now I have a favor to ask of you. 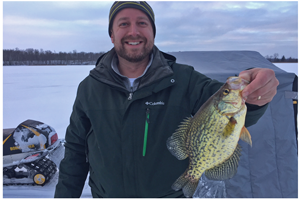 For those of you who are located in northern Minnesota, keep your eyes peeled for a special ice fishing tab that will be circulated in the Grand Rapids, Walker, Virginia and Hibbing newspapers during the first week of January. In it, you will get this exact story, but told from a much different point of view; one that I hope you will appreciate. Don’t worry, for those who don’t have access to the local papers, I will re-print and link back to that article later, but I did write it for them and they do deserve to publish it first. I’m off the ice today, but we have a gigantic ice fishing shindig planned for tomorrow. I doubt that you’ll see us out there because security is tight; obtaining clearance is tougher than getting an official James Bond 007 card. Even Cub Reporter, Staff #003 is going out blind-folded! But don’t worry, I’m gonna sneak my secret spy camera into the heel of my boot so there will be a full accounting of whatever happens out there! 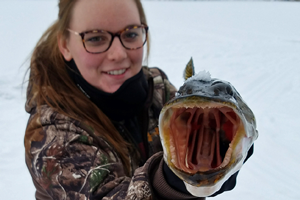 "Ice fishing continues to be very good. On the south shore fishing Big Traverse Bay, nice mix of walleyes and saugers in 20 - 28'. Varying ice conditions all over the lake so please go through a resort and use the ice roads as they are checked daily and groomed for smoother travel. Some ice roads allowing 1/2 ton trucks. Most resorts update Facebook pages for current info or call ahead. Water clarity is good. Some days jigging line is hot, some days dead stick with a plain hook / minnow. Gold, glow, and pink are good colors. Try a rattle if fish not reacting. Auger extension could be necessary in spots where ice is layered. The Rainy River is ice covered with a few local fish houses here and there, but overall, with current of the river, we suggest working through resorts for safety. The majority of the resorts fish the lake. The NW Angle has good ice conditions where resorts have ice roads / trails and fishing has started out excellent. Walleyes in 22-26' with mixed in saugers, pike and perch. Jeff Sundin Fishing Report December 26, 2017 "Thickening the Thickenable"
Well, I guess that there must have been a lot of folks asking for ice this Christmas. At least that’s what Mother Nature thought she heard you say; so she’s delivering the goods. All but the deepest and most stubbornly slow freezing lakes already have more than enough ice for snowmobiles and ATV’s. On Friday, I set out to fish on a deeper lake and I walked out over the top of 50 feet of water. I found 10 inches of solid, black ice with about 5 inches of snow cover on top and I set my mind that from here on out, I’ll be travelling by snowmobile to spots like this one. On Saturday I fished a larger, but shallower lake and found 13 inches of good ice. 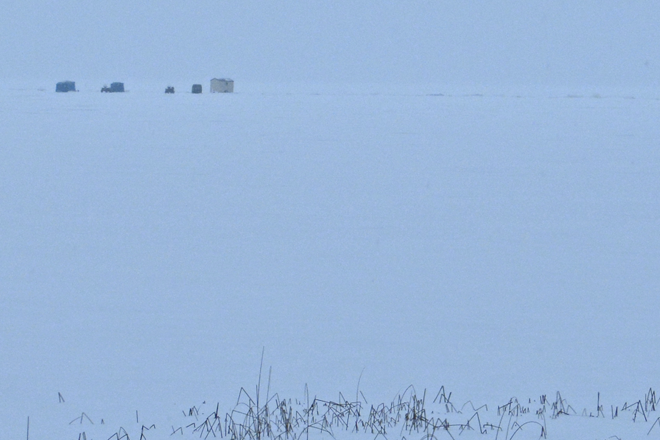 From my portable shelter, I watched a man drive onto the ice with his pickup truck. He paused, then stepped out and grabbed an auger; he drilled a hole and measured the ice thickness. He repeated that process until eventually he’d seen enough and returned to shore. I’ll bet that the next time I see that truck, it will be sitting over the crappie hole alongside a permanent shelter. His wasn’t the only pickup truck I saw that day; there were a couple of others out on the ice already. The owners of those trucks were obviously easier to convince that the ice was “safe enough” for vehicle travel. I wish I could tell you that the fish were biting like crazy, but these first two experiences were slow ones for me. I could see fish on my Humminbird; I could even tease them to move up to the bait, getting them to strike wasn’t so easy though. So the Hippie Chick is still waiting for her first meal of fresh fish from the ice. Prior to Christmas, there were several resorts and rental operators announcing their plans to allow vehicle traffic after the holiday. This cold snap should be playing into their hands, so I’d expect to hear announcements about roads opening up this week. Further north, reports from both Red Lake and Lake of the Woods continue to be good. I heard from friends and neighbors who fished on Red Lake over the weekend and they all came home with fish. Early morning seems to be the best, walleyes rally before 9:00 AM and then the action slows during the day. There’s another feeding run at dusk, but the action doesn’t get as intense, and it is short-lived. OH, by the way, I KNOW that many of you received your Christmas Card last week. But if you didn't receive one, then maybe something's gone wrong with your email listing on the the "Insider's Newsletter". "The strange weather patterns we endured in late November and early December has made the ice on the large deep lakes in the area ice somewhat suspect. The freeze up, warm up and then go out syndrome we were exposed to was not a good thing for these lakes. This happened twice on the large deep lake I usually fish and before it finally froze over entirely you could count the holes made by springs for several days. These springs will be a spot to fish once the ice thickens enough to go out on but that probably won’t happen until after the polar vortex gets through with us, after Christmas. Two snowmobiles went down in the shallows a few days ago, luckily nobody was hurt and their sleds were easily retrieved the following day. Ice near shore is usually considered safe but this is not always the case. The inconsistent ice on some of these big lakes is rule for caution. The shallow lakes have mostly consistent ice thickness around 9 to 10 inches. The anglers on these lakes have been doing great on Crappies with some nice Perch being taken as well. The smaller lakes have been producing some large Sunfish and ice thickness is reported to be 10 to 12 inches. There has been no mention of Walleye in the area, all though Pike have been biting well. "Fishing has been excellent! We have had a strong bite going with many nice eaters and many big ones in the mix. Most of the larger fish have been suspended, so electronics are a big benefit to anglers looking for a big one. We are situated in 24-27 feet of water just off of Pine Island which makes for a quick trip to the houses from the resort. Standard gold and glow red are the best options, something which rattles on a jigging rod and also having a dead stick is a great approach. Many anglers have had only 1 line down at a time. "Ice conditions vary right now so please call ahead to the resort you plan on going out of to check ice report and what type of vehicles are being let out if you are bringing your own gear. If using resort and they transport you, no worries as they will have you covered. Varying ice conditions all over the lake so please go through a resort and stay on the marked ice roads as they are checked daily. Auger extensions could be necessary in spots. Water clarity is good and ice fishing continues to be very, very good. The morning bite has been great for walleyes and then the bite turns to more saugers with some walleyes mixed in for the afternoon. Walleyes and saugers are loving pink and gold jigs tipped with a shiner. Sorting through smaller fish with nice keepers mixed in. Quite a few big fish coming up the holes as well. On the Rainy River, ice stretches from shore to shore and some locals are out who know the river well but ice varies greatly, currents change thus overall unsafe for consistent travel and fishing at this time. Safety First." - 1-800-776-3474 Border View Lodge . Wired2Fish December, 2017 "Simple Tips to Master Your Graphs for Better Fishing"
"After winning two events in 2017, Justin Atkins reveals why his mastery of electronics has given him a competitive advantage in fishing. Forrest Wood Cup champion Justin Atkins looked back on his year and winning two bass fishing championships this year due completely to the time he has spent mastering his Humminbird electronics on his boat. "What is it about the pursuit of fish that has such a deep effect on our lives? 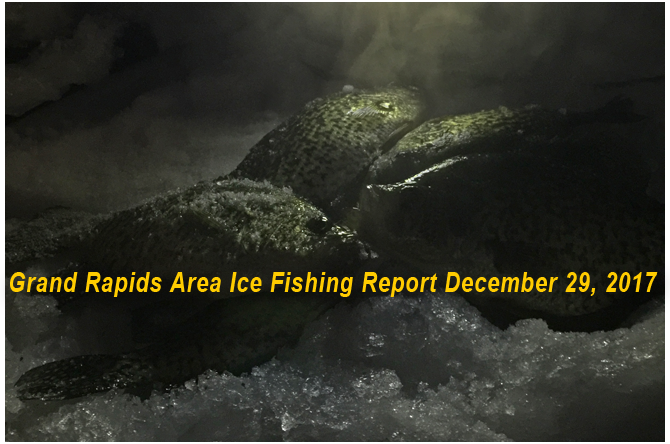 Jeff Sundin Fishing Report December 18, 2017 "Grand Rapids Area Ice Fishing Reports"
Okay, if you checked in early this morning, then you already know about the tragic death that ocurred over the weekend. If you didn't and want to read the original report, it follows this update. For now though, I think it's to share some better news. Christmas vacation time came early for my daughters this year. So I borrowed some time away from the ice fishing season to spend part of the holiday with them and their two strapping young lads. 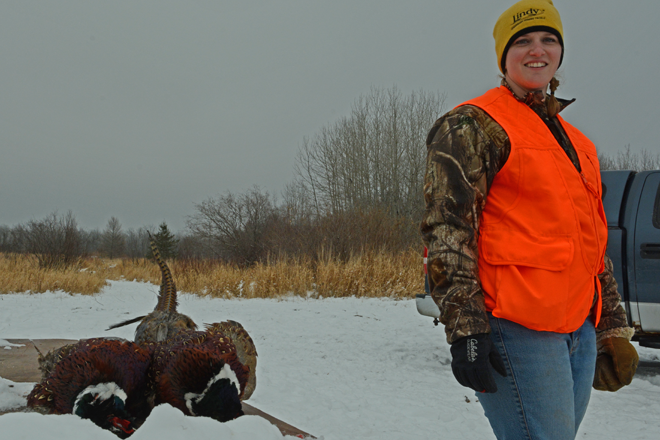 Part of the festivities included a pheasant hunt at Bader’s Pheasant Run in Federal Dam. Wade and Deb Huotari run a first class operation and always make us feel welcome, this was no exception. The dogs got a nice workout, I think putting up almost every single bird that was placed in the field for us. We bagged 80% of the birds and left the field with a pretty good idea of the areas to which the rest had escaped. So I think it’s safe to say that for us, it was a “bang up” celebration. By the time we wrapped up our hunt, I still had a couple of daylight hours and since Ice fishing was on my mind, I toured some of the lakes along my route back home. There wasn’t a single lake that didn’t have some ice fishing activity. On some, there were only a couple of groups, but on others, the crowds were large. Most of the folks I spotted were travelling on foot and some of them were using ATV’s. Whether it was smart or not, a pickup truck was parked, apparently safely on one the smallest lakes located just west of Grand Rapids. Talking with anglers, the ice thickness on most lakes averaged about 10 inches. One estimate of 8 inches and another of 14 inches represented the two extremes. Of the species targeted locally, crappies have been the most cooperative; Northern Pike have been somewhat active too. 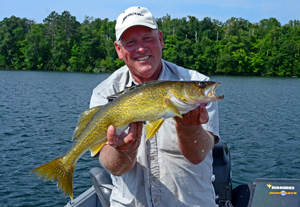 Barring a trip to Upper Red Lake or Lake of the Woods, Walleye fishermen in the Itasca Region might be interested to know that Leech Lake has been producing some good evening walleye action. The ice on Leech Lake is not uniform though, so if you’re thinking about heading that way, plan on fishing the shallow water bays for now. I have asked for updates from the resorts and rental operators over there and should have more info on Tuesday morning. One of the neatest stories from the weekend was about a tiny lake where the crappies were both cooperative and large. One good part of that story is that the fish were admired and released. It’s not that some of them won’t eventually wind up in a frying pan, a portion probably will. But I like the idea of selective harvest and the notion that taking them out of the lake isn’t the only way to enjoy the experience. So my hat’s off to the young couple who shared the story. A conversation with one of the Walleye fisherman I ran into was interesting. Based on experience, he’s observed that walleyes frequently have a starting date that does not necessarily coincide with the earliest available ice. He shared with me that his group has had no trouble catching crappies; perch haven’t been hard to find either. Their main pursuit is and always has been walleyes though and so far, they’ve been scarce. Interestingly, he wasn’t worried in the least about the slow action because based on his experience; the walleye bite never gets really good until closer to Christmas. 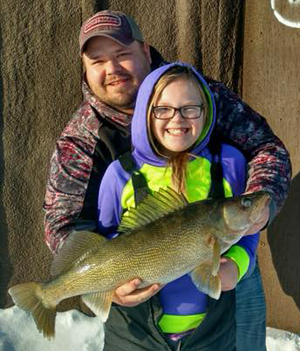 “We never start catching good numbers of walleyes until about December 20th. 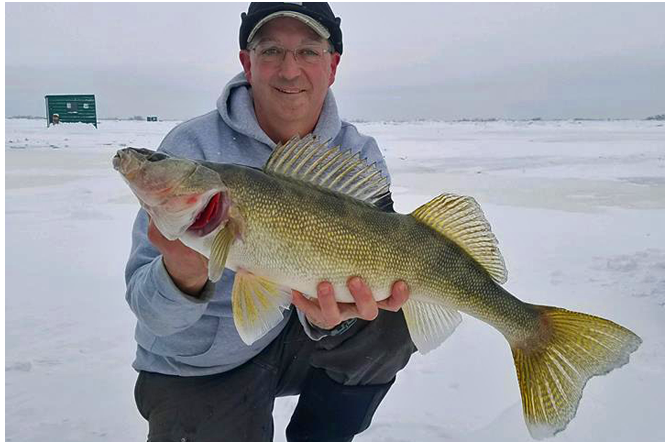 Even during years like this one, when we can get on the ice much sooner than that, the walleyes drag their feet for the first couple of weeks”. Speculation about why that happens might revolve around the walleyes propensity for being active when the weather is stable. Maybe the moaning and groaning sounds of early ice throw them off, who knows? It’s an interesting subject and an optimistic observation for folks who prefer to wait for thicker ice before venturing onto area lakes. From this morning's early report; "Today’s report isn’t an easy one to write for me. Knowing that most anglers in the Grand Rapids area are travelling safely and having loads of fun on the ice, I am reluctant to bring this up. But while I’ve been looking at dozens of photos of folks showing off smiling faces and flopping fish, another tragedy struck the Grand Rapids area this weekend. On their way out to the Crappie hole on Rice Lake this Saturday, Michael Gibbons and Bernice Kane broke through the ice using a side-by-side ATV. Gibbons managed to get out of the water and call the Itasca County Sheriff’s Office. But, by the time authorities responded, Kane was believed to have drowned. Her body was recovered from the icy water on Sunday afternoon. There’s no way for me to know exactly what happened, but I do know that lake. There are areas of current, other areas of very deep water and lots of ways for the ice to have frozen to different thicknesses in different areas. The lack of uniformity is the pitfall on a lot of these deep water lakes right now. The ice may be good over shallower water, near the shoreline where it froze early. In those areas the ice may already be up to a foot thick right now. The problem is that on a lot of lakes, the early ice that formed over deep water never got more than an inch or two thick before a warming trend set in and opened up the midsections of these lakes. Now we have snowmobiles and ATV’s travelling into uncharted territory and finding these thin spots the hard way. December 15, 2017 - "Clearing Up The Clearable About Grand Rapids Area Lakes"
Q) On December 13th, Jon Tretsven wrote; “Hi Jeff, I quite often read your reports. We do some fishing on Deer and Moose, staying at various resorts on that lake. A lot of our fishing is for muskies but we do some walleye fishing. Despite how close you live to these lakes and how good of a walleye population they have, I've never seen them mentioned in your reports. Do you ever fish them? If so, any tips (besides to fish at night) or why don't you fish them more? Thanks! A) Jon, I do fish them, but I tend to not mention lakes like these by name. In some cases the bites are too limited to be exploited by large numbers of anglers, sometimes there's just not that many fish available and sometimes, I just don't want to get my tires slashed by possessive fishermen; any more. December 15, 2017 - " Winter Walleye Suggestions?" Q) On December 14th Dave Johnson wrote; "Jeff, I live in Hibbing and usually stick to the local lakes when it comes to ice fishing. However, I do like to go in light and explore mystery lakes from the DNR Lake Finder website. Although it's not a mystery lake, Jessie Lake appears to be a good walleye lake. My question; is it a productive walleye lake in the winter? My fishing style though is once I set up, I don't move. The heat is on, the radio is on and I’m relaxing. If I do catch fish, it's a bonus. If you have any advice on lakes around the Hibbing area to try, it will be much appreciated." A) Dave, thanks for getting in touch. Jessie does have its good days, and I'd guess that some of those do occur during winter. I'm afraid that I've only ever fished there during the open water season though; it's never been a winter destination for me. There aren't many lakes that I know of where an angler can consistently drill one set of holes, on a single spot and wait out the Walleyes. This is one of the reasons that you'll notice that the topic of almost all of my winter videos and articles focus on panfish and perch. When I do fish for walleyes, I tend to head for larger lakes with big populations. We go to Lake of the Woods, Upper Red Lake, Winnibigoshish, Leech and Mille Lacs. A small lake for us would be something on the order of bowstring. Wired2Fish Decedmber 13, 2017 "How to Store Fishing Rods For Protection and To Save Space"
"Keeping your equipment out of harm's way and organized will ensure that they are in proper working order the next time you go to utilize them. Jeff Sundin Fishing Report December 13, 2017 Ice Conditions Report - "Tracking the Trackable"
On tour this Tuesday, I headed west from La Prairie and drove the loop around Deer River’s “Northwest Territory”. 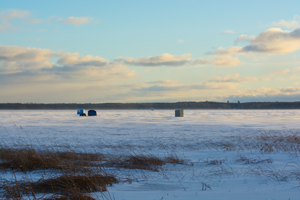 Making stops at Cutfoot, Little Cutfoot, Bowstring, Jessie and Sand Lake, I found folks ice fishing on all of them. Traffic on Bowstring was the most robust, I only viewed one angler on Sand and the rest were “in-between”. Small groups of fishing shelters were scattered around the north and west sides of Bowstring. I didn’t make the detour into the south landing, but Lynne Powell at Fred’s Bait had already given me a heads up that there have been folks fishing down there too. I assume that small groups of fishermen are using that landing as well. There is a visible pressure ridge in the northwest corner and it appears to separate traffic. If you come out of Trails End Resort, you’d be forced to fish on the northeast side of the crack. Head onto the lake from the northwest landing and you will need to stay closer to the west/southwest shoreline. ATV’s were moving freely and most of them were towing portable, flip-up shelters. There were a couple of 4 wheelers parked near permanent shelters, but so far, there are no large groups of big shelters out there. A friend who lives near Bowstring reported spotting a pickup truck on the ice over the weekend. I can’t verify that and I wouldn’t endorse you driving your truck out there either. But it does suggest that folks are gaining confidence about ice conditions on the big lake. Fishing reports are still hard to come by, but the few I’ve received from Bowstring have been good. Both Crappies and Perch were cooperative over the weekend, Walleyes haven’t been mentioned yet. There had obviously been folks fishing on both Cutfoot and Little Cutfoot Sioux. By Tuesday, most of the evidence was provided by holes, previously drilled in the ice. So far, foot traffic has been the most popular on either of those two lakes. That means that most of the anglers have not ventured onto the lakes mid-section. Big Cutfoot is one of the lakes that re-opened after the initial early freeze up. It’s a 100% certainty that ice thickness over the mid-section is not equal to that of the ice around the shoreline. ATV’s could be used around the edges of the lake, but it’s questionable whether or not the deeper mid-section has enough ice to support ATV’s. 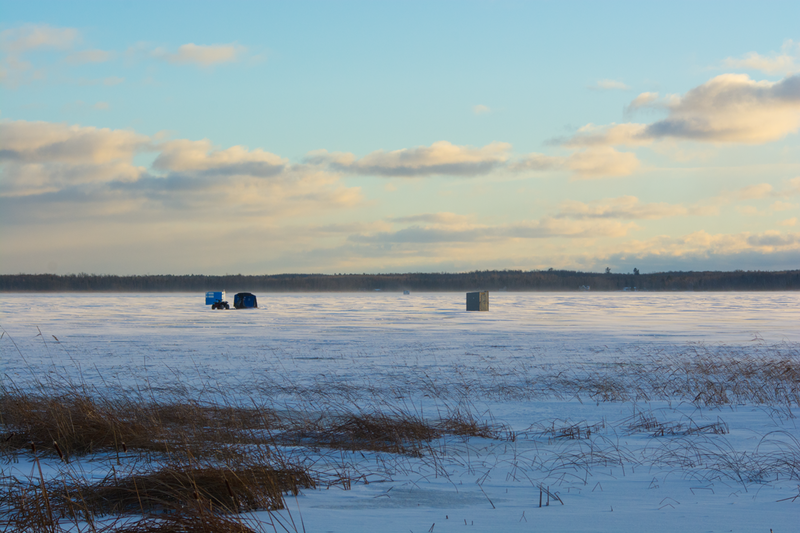 On Jessie Lake, spearing shelters placed along the lakes first drop off make up most of the angling pressure. There isn’t any widespread travel around the main lake so far. Snow cover is minimal out there, so an angler could easily travel the shoreline by ATV to get close to a good fishing spot. Park the ATV once you’re in range and then hoof it to the “honey hole”. 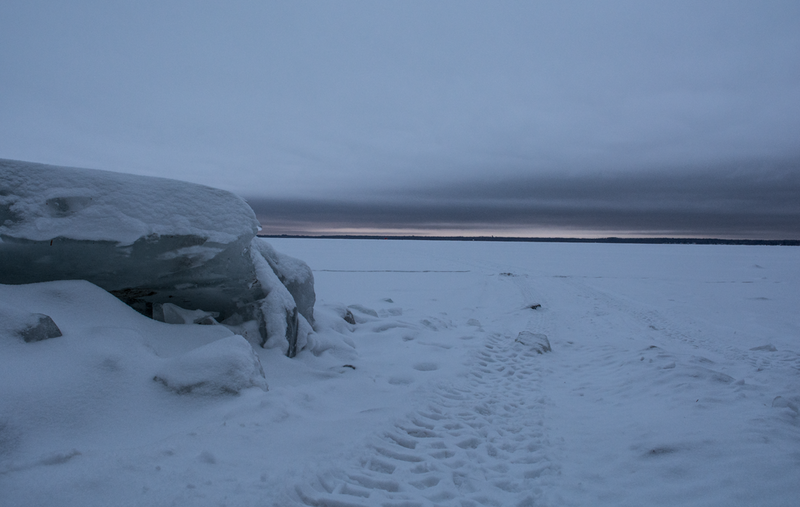 The ice on Sand Lake is very thin and the only angler that I saw out there traveled on foot. I’d be surprised if the ice was more than 5 or 6 inches and I would not attempt to use a vehicle of any type for a week at least, maybe longer if we get much more snow. After I left the Deer River area, I headed home via the Deer/Moose Lake Road (County Road 19). As I drove between Moose and Deer Lakes, I noted that both are completely frozen now. Deer Lake had a couple of small, wet looking cracks lying under the shallow snow and there was no visible traffic of any kind. Moose Lake sported ice that looked better, there were no visible wet spots in the snow and there was a single angler who had driven a side-by-side to his/her fishing spot. Other than that single portable shelter, it looked pretty lonely out there. By the time I turned south on County Road 62 toward Cohasset, the sky was getting dark. There wasn’t a lot of visibility as I passed the east side of Bass Lake. There were a few shelters out there, but they were spread out along the breakline. Since there’s no vehicle access over there, I’m sure that the anglers who are fishing on that side of the lake are hoofing it from Co. Rd. 62. I did not see any sign of folks travelling by ATV and there wasn’t any movement heading westward. Snow, about another half inch of it, fell during the evening and overnight. Between what we have already and what’s predicted to fall this week, I think it will be just deep enough to travel by snowmobile to selected areas this weekend. "If you wonder how you get such detailed fishing screen shots on new fish finders and side and down imaging technologies. I’ve been sharing some of my fishing screenshots from my Lowrance HDS Carbon units recently on the Wired2fish Instagram page, and I’ve had a lot of messages from people wanting to know how I get such clear shots and how my screenshots show fish that actually look like fish. The answer is two fold. On one hand, I was hoping for a little more snow so we could start using snowmobiles soon. On the other hand, I was hoping that we didn’t get too much snow because I want the ice to get thicker faster. Mother Nature must like the story about the three bears, because the snowfall she delivered on Monday morning was “just right”. In La Prairie, there’s about 2 inches of snow covering my yard. South of Grand Rapids, some of the snow on the lake was blown off by strong wind, but most of it stayed on the ice. While the snow depth is not ideal for travel by snowmobile, there should be enough to give the skis a little grip so we won’t be twirling in circles on glare ice. Getting around on the ice without cleats on our feet will be a lot easier too and that’s nice. Portable fishing shelters towed by ATV’s still make up the lion’s share of traffic on Grand Rapids area lakes. Larger shelters, mainly spearing shelters have popped up too, but anglers with heavy shelters and wheel houses are still driving further north to use them. So the takeaway from today’s report ought to be that conditions are improving fast. But extreme caution is still required, no two lakes are the same and even “good looking ice” can suddenly give way to thin, unsafe ice. Jeff Sundin Fishing Report December 11, 2017 "Managing The Manageable"
Managing to bag a management Deer wasn’t too manageable this weekend. But I can’t say that I was disappointed by the closing hunt of the Muzzleloader Deer Season. I did come close to filling the freezer, seeing Deer on Saturday and again on Sunday. If I’d been a little bit closer to any target, I may have pulled the trigger. But when it comes to taking shots in thick cover with my muzzle loader, I’m a “scaredy cat”. I don’t mind the idea of missing the shot cleanly; I just don’t like the idea of wounding a Deer that can’t be recovered. Besides, the image of those 4 does slipping past me in a single file line will be a nice memory this winter. I’ve said for a long time that does are safe from me and management aside; I like the idea that I gave them a pass better than the idea of sautéing them with onions. No matter, the season is over and the point is moot. So here we are, nothing left to talk about except ice fishing and luckily the timing for that is good. Our current ice conditions are good for walking and in some cases not bad for ATV’s either. Weather forecasts of single digit lows will complement the formation of more ice, adding a cushion of safety. There’s snow falling right now and has accumulated about 2 inches so far. There is a blustery wind on the way, and that will force some drifting, but I don’t think enough to cause major trouble. Besides, sweeping the snow off of the ice will further help the formation of more ice. Walleye fishing reports from Red Lake and Lake of the woods have been favorable. But Panfishing reports have not been that great so far, especially reports from the Grand Rapids area. I feel that there’s a change coming though, I’ll bet that this week will be the turning point for things to start getting hectic. "We are getting close! We currently plan to open on Wednesday the 13th. Reports have been great for those with snowmobiles and portables. We are expecting a great season! There is still some time to take advantage of our special. Christmas comes early! We are giving $100 off the regular package price for any reservation booked to arrive on Wednesday, December 20th or Thursday, December 21st." - 1-800-776-3474 Border View Lodge . Lindy Fish ED "Getting Portable When Using Rental Ice Fishing Shelters"
"Rental Sleepers and personal warehouses are growing in popularity. That's thanks to the elbow room and comfort they off anglers of all ages and physical abilities. "The guides went out and checked conditions today in the areas we fish and travel. They found 7-9 inches on Four Mile Bay and 8-11 inches on the lake where we fish. However, they did find some areas with less than that on the lake especially to the west. We have anywhere from ½ to 4 inches of snow on the lake and 1-7 inches on the bays. That being said we are going to wait for a few more days until we can build a few more inches before we start. Our first day in our day houses will be Sunday, Dec 10. Our sleepers are hoping to start the 14th and Oak Island location in a few weeks. "Anglers in the Edge of the Wilderness area have been anxiously awaiting conditions that would force the big lakes to freeze over. The smaller lakes have had ice for a week or two, while the larger lakes have remained open. We've had reports of ice thicknesses up to 9 inches or more on the smaller lakes. 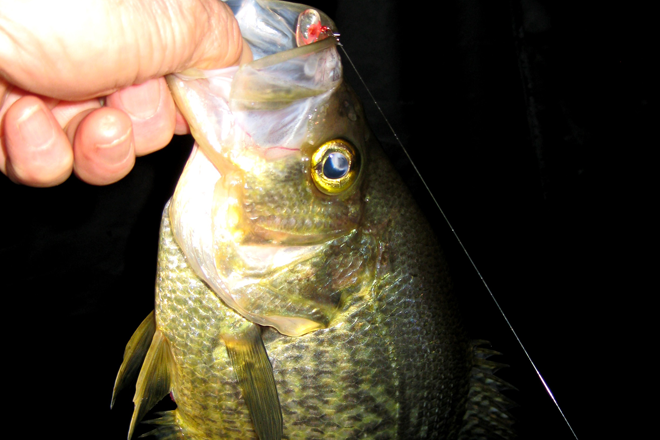 Ice anglers who have been out fishing have done well with Crappie and Pike. Several of the large deep lakes that were frozen last week opened back up on Monday, the result of the rain and ice pellets that were a part of the storm that roared through the area. As of last night, many of these larger lakes have finally frozen over. With the cold temperatures forecast for the rest of the week and into the foreseeable future, we should be making ice quickly. Be safe out there!" "Last I measured (3 days ago) we had a good 7". WHERE I MEASURED! I've seen people heading toward Cow Bay, but I wouldn't go that far yet.But no one has drowned on our lake yet. "We had 4" of good ice in front last weekend...but it got bad in a hurry. The gap was open on Saturday and the ice was off the shore by Sunday. Under the Hwy 46 bridge is open water today. This weather is making ice, the gap is frozen again and ice is to shore, but we have a ways to go. Only about an inch of snow on the ground and pretty much nothing on the ice, so we should have a good week. "In front of the resort the water is open but know it will settle with this cold once the wind calms down. "We put houses out on November 22nd on 5 inches. We do have all our houses out in 3 diferenet locations. Yes with this warm and cold and warm and cold it was a bit off. But really didn't get touchy till this past Sunday and Monday when it didn't refreeze for 3 days. But Mondays storm sealed it all back up and we are now sitting pretty good. I know that I’m behind the curve; there are lots of folks already finding places to ice fish and I haven’t even wet a line yet; that’s okay. With the St. Paul ice fishing show behind me, the first ice fishing trip of the winter isn’t far off. But before I can get serious about the ice season, I’ve gotta take one last stab at deer hunting. It had been a few years since I did any hunting at all and bagging that spike buck this fall definitely helped renew my enthusiasm. Besides, sometimes the Hippie Chick reminds me that one deer didn’t really fill the freezer very well. A second one would go a long way toward putting a smile on that girl’s face and who I am to deny her happiness, right? In the meantime, I’ve been checking with friends and it appears that we are on the verge of seeing decent ice beginning to take hold on the larger lakes. So far, there isn’t a “big lake” that has widespread traffic, but there are encouraging reports coming in from Leech, Winnie and Cass Lakes. "On calm nights, Walker Bay has skimmed over with ice. It would like to freeze over. But, the past few days have been so windy, it is open now. First calm night the Bay will likely freeze over and stay frozen. "The wait may be over soon for cold temperatures to create more ice. Varying ice conditions to report currently. Water clarity appears good. Resorts are out measuring ice thickness and assessing ice conditions where they can and will continue to do so all week. Safety is #1. Back bays are frozen over with 4 to 10 inches in many areas. Some pike action in back bays thus far. The Rainy River has a skim of ice across it with only a few open areas left. Water temperature remains 32.2 degrees Fahrenheit. On an average year, resort fish houses get out on the main lake mid December and stay on the ice through March 31st, but Mother Nature has the final say so. ATV's and collapsible fish houses will get out a bit earlier based on when resorts who maintain ice roads feel it is safe. When resorts open ice roads, stay on marked trails and don't deviate for safety. Walleyes and saugers are staged up nicely along south shore and in the NW Angle. Walleye and sauger populations are strong. 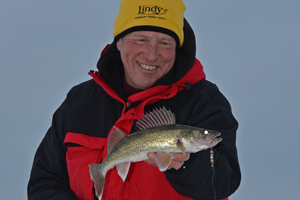 Lindy Legendary Fishing Tackle December 5, 2017 "How to use the Lindy Rattlin' Flyer Spoon For Walleye"
The Rattlin' Flyer Spoon is one of the most reliable and consistent Walleye lures on the ice for many years. It's helped a lot of anglers put more Walleyes on the ice, including veteran fishing guide Jeff Sundin. December 5, 2017 - Ice Fishing Lines; Which One Is Best? James Friedrichs Wrote; Jeff, I’m preparing to re-spool my ice fishing reels and I’ve been looking for advice about which line to use. I have 3 friends who are avid ice fishermen, all 3 are successful, all 3 use different lines and all 3 have offered different advice. What do you think is the best way to rig up for Walleye, mono, fluorocarbon or braid? Also, do you suggest using leaders or swivels, how do you rig up your ice gear? James, your question is timely because I happen to be asking many of the same questions. Supplies of my “go to” fishing line (more about that later) recently became unavailable and when I started searching for a replacement, I too was bombarded by an array of advisors whose advice left me with more questions than answers. The confusion in part is because choosing a fishing line is subjective, what works for one, can be a nightmare for another. So understand that my answers are based on the fishing scenarios I encounter most often. In the end, your fishing situation(s) may lead you to conclusions that differ from mine. In the interest of giving you the most balanced answer, I fired up the buffing machine, polished up my Cub Reporter, staff #003 Research and & Development badge and started walking the show floor at the St. Paul Ice Fishing Show. I surveyed fishing pros, retailers and experienced anglers and while opinions varied, there are some common beliefs. Braided lines should be reserved for situations where low stretch is critically important; that was the common opinion of most of the pros I talked with. Braided “super lines” do have a place in ice fishing, they do not stretch and that affords a greater level of sensitivity. Super sensitivity is what most folks like best about them, but no-stretch line isn’t always necessary. Sometimes stretch is good, especially for walleye fishing. The extra sensitive braided lines can cause anglers to be “jumpy”. Over reacting to strikes can lead to missed hook sets. Besides, most of today’s ice fishing rods are more than sensitive enough to transmit the sensation of a strike, even with inexpensive line. For applications like Lake Trout fishing or situations that force you to fish in very deep water, braids make sense. But for ice fishing, the disadvantages of braids are hard to overlook. They retain more water than conventional fishing lines and are prone to freezing up when we fish outside of our ice shelters. Windy conditions cause trouble too, untangling mono with cold fingers is bad enough, but when super lines get tangled, they are even trickier to unwrap. For me, those nasty little cuts that they leave on my fingers is reason enough to avoid the braided line offerings especially during the numb fingers season. If you really need it, use it, but most of the pros I interviewed don’t believe that they “need” it. When asked about Fluorocarbon lines, the debate got more interesting. Some of the pros are really into it, but some of them are not. Some admitted being influenced by experiences with early offerings and reserved opinions because they haven’t tried newer, improved versions. Minimally, there was universal agreement that fluorocarbon is the real deal for making leaders. It is ultra-clear and super abrasion resistant, making it perfect for tying leaders. To a person; they all agreed that fluorocarbon is a must have item for tying leaders. Fluorocarbon, in the early days, tended not to be very supple and was known for coiling up on the reel. Sometimes the line came rolling wildly off of the reel, forcing long untangling sessions. Newer versions have addressed some of the issues, manufacturers say. Some anglers said that it’s great when it’s new but doesn’t last as long on their reels as monofilament does. So for me, the jury is out, but I will give fluorocarbon a try this winter and so I can sort out which ones I like and which ones I don’t. Monofilament line still offers a reasonable balance between being strong and supple. For most of us, any one of the “softer” fishing lines offered by manufacturers would likely be just fine. 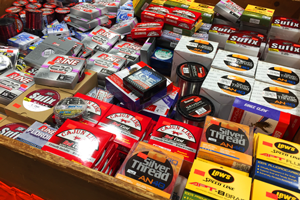 Avid anglers agreed; they avoid buying the “extra tough” versions because they are produced to offer better abrasion resistance, but at the cost of being nimble. Copolymer fishing line is what I’ve been using over the past several years. The problem is that my favorite one disappeared from store shelves because it’s gone out of production. The disappointment of losing my favorite “go to” line is one reason I spent extra time researching this question; I had to find a new line for myself anyway. Copolymer doesn’t absorb water like monofilament does and that helps reduce freezing up. I like to fish outside so for me, reducing freeze ups is a major advantage. The copolymer line I used didn’t have a lot of “memory” either; I liked not having to worry about my line getting coiled up. My search for an alternative line at the ice show led me to Dale Black, who along with his wife Heidi acquired the fishing division of Gamma Technologies in November 2010. I’ve watched Dale over the past few years as he tirelessly carts his wares from one outdoor show to another. Black was the only manufacturer who thought showing up for this show was important, so by default he became the world’s foremost authority on fishing line at this venue. He walked me through his entire line of products and explained the features and benefits of each of them. His sentiments echoed those of some other anglers I’d interviewed; use braided lines for deep water, fluorocarbon for ultra-clear water, monofilament for a good all-around balance and copolymer for cold weather. 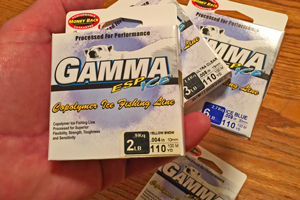 Luckily for me, the Gamma lineup does include a copolymer “ice line” and he had enough of it on hand so that I could buy enough to set up a few spools. I picked up some 2 and 3 pound test for panfish along with some 6 pound test for walleyes. I guess you could say that this is sort of a blind endorsement. Maybe it’s because his presentation was flawless or maybe just because I’ve seen him working so darn hard at these sports shows, but either way I have a feeling Black steered me in the right direction. Jeff Sundin Fishing Report December 2, 2017 "St. Paul Ice Fishing Show Today"
The St. Paul Ice Show began yesterday, and I think it's safe to say that you can easily live your "ice fishing life" vicariously through the images and stories about ice fishing that you'll see here. I've been sneaking around, making my list of "must haves, gotta gets and wish I hads. Why don't you stop by and compare notes about the new and improved that needs to wind up in your shopping cart for the 2018 ice season? The regular public show hours today, December 2nd are 10am to 7pm. But if you’re anxious to get in on the hot deals early, you can buy VIP TICKETS at the door and get in two hours early. That's right, you can walk in and start filling your tackle boxes at 8:00 AM! What is barotrauma? Simply stated barotrauma is “injury caused to the body by changing air or water pressure.” In humans we know this as “The Bends”- a dangerous condition that divers experience when they come up too fast from deep water. Believe it or not, something similar happens in fish.